Can I create my own widgets? That's the real reason we created PowerTools in the first place. Let's try a simple example. How many times have you wished there were a combination label and field control that you could just drag onto a new stack? Let's add that capability to PowerTools. Drag a field control and a label control onto the new stack and align them the way you wish. For our example let's place the label control to the left of the field control. Now select both the label and the field and group them. Now click on the Help icon of PowerTools. See the question-mark-in-balloon icon at the top? Click it. This is the About panel. 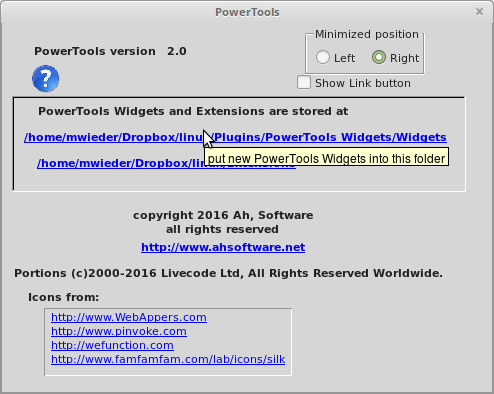 Now drag the new group widget to the middle of the about box where you see the Plugins location to place it in the PowerTools Widgets panel. Open the Widgets panel and see your new custom control. Now you can drag your new grouped field-and-label control onto new stacks.